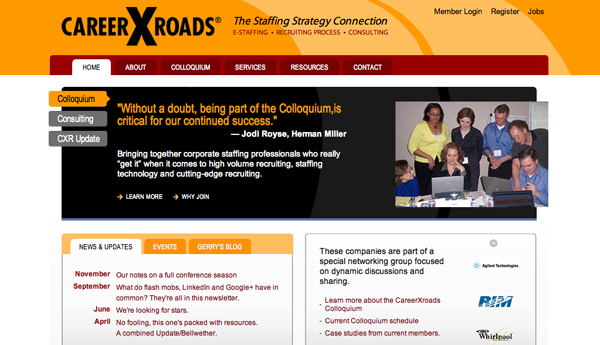 We launched a new website for CareerXroads today. TBH Creative was hired by CareerXroads to conduct a site audit. We went page by page and provided a detailed report of suggestions with priority for upgrades and fixes. The suggestions presented led to many upgrades on various pages throughout the website including a revised and more intuitive sitemap. The most notable change was a home page and template redesign. We added more interactivity on the homepage with custom built content sliders using JQuery technology. The footer is also interactive on the homepage and each interior page to highlight their social media without taking up a significant amount of page real estate. In the recoding process for the new design, we removed all Flash elements and replaced with JQuery for a better mobile experience. 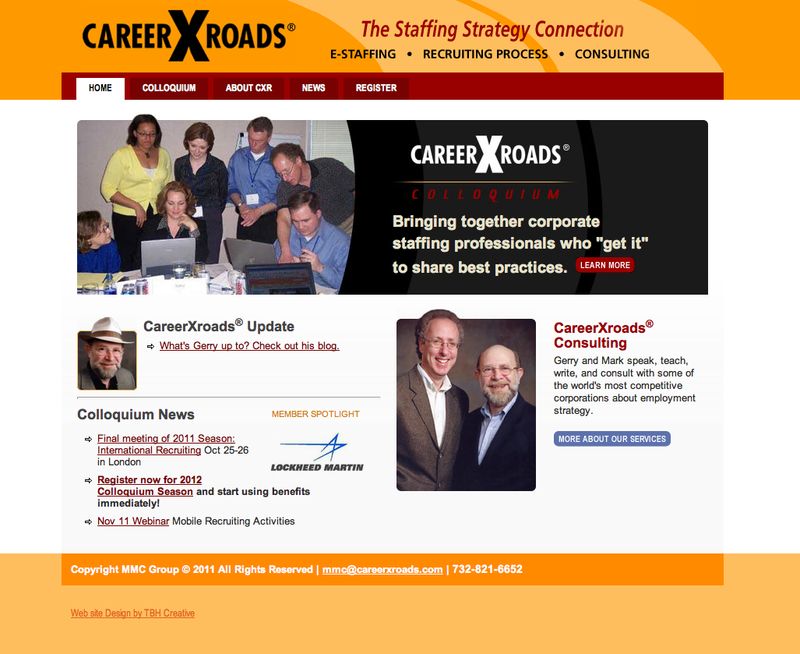 CareerXroads' homepage prior to redesign. 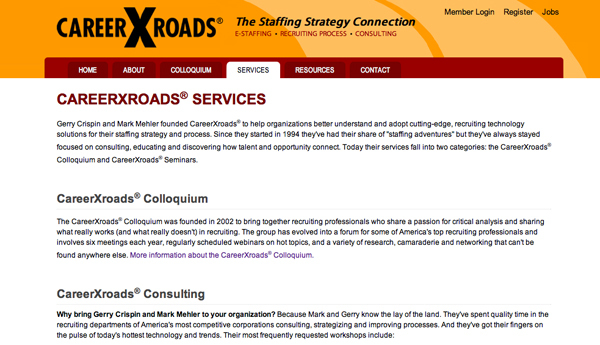 Gerry Crispin and Mark Mehler are the personalities behind CareerXroads and the CareerXroads Colloquium. Mark and Gerry have worked for and with corporations of all sizes in career planning and placement, contract recruiting, executive search, recruitment advertising and human resource management. After years working on the front lines of recruiting, these two saw a new potential in the Internet and in 1994 came together to create CareerXroads. TBH Creative worked closely with CareerXroads to develop a web solution that fit their needs and plans for future online growth. We divided the web project into phases and look forward to helping them more in the future. If you are looking for a web partner, choose TBH Creative for insightful ideas and recommendations. We offer web strategy, planning and website audits if you don't know where to start or what you need. Allow us to give you an expert opinion and many options.